Here’s one that’s come out of the auto-title generator: type in a theme and it’ll randomly mix up the names of other films that might or might not have some kind of connection to it, thereby building inter-textual links with more famous productions (and possibly even duping a poor sucker or two into downloading the damned thing by mistake). Suffice to say, this has absolutely nothing to do with The Last House on the Left, not even any kind of shared plot elements, and even less to do with The House By The Cemetery. Instead it’s a low budget ghost movie from the prolific North Bank Entertainment, a company based in Swansea and run by director Andrew Jones, who has made nine low budget horror movies since 2013 and has another four either in post or pre-production at this very moment. Give the man his due: he’s getting these things made and he must be generating some money out of them, presumably from TV sales, so all credit to him. The plot begins as screenwriter John Davies (Lee Bane) moves into a holiday home for an extended retreat in the hope of breaking his writer’s block and to theoretically kick-start him into coming up with some new ideas. He’s rather taken aback when the letting agent explains that an old lady lives on the upstairs floor, but not to worry because she never leaves her bedroom (quite how she eats or goes to the loo is a moot point). John spends his days staring at the typewriter, but notices that the furniture sometimes seems to have been moved around and is frequently disturbed by an old fashioned tune playing on the gramophone, which he supposes is just the mysterious old lady upstairs’ doing. In the meantime he meets and falls in love with a neighbor, Cassie (Georgina Blackledge), which finally seems to get his creative juices going. But something sinister is afoot involving murder, madness and ghosts. 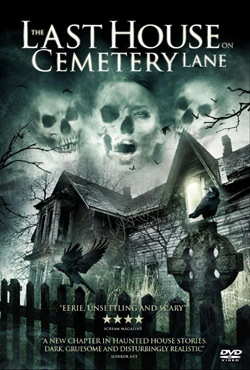 Although it’s not exactly a good film, The Last House on Cemetery Lane is a surprisingly likable affair. The plot is old hat and the script littered with insane dialogue, while nothing much actually happens for large stretches of the running time, despite a couple of incongruous nightmare sequences being thrown in to break up the tedium. Although Lee Bane – a North Bank Entertainment regular – is fine in the leading role, the other performances are scratchy, with Tessa Wood (who appeared in Triangle over thirty years ago!) being particularly unbelievable. But there’s something rather enjoyable about it all in a low-rent kind of way: Jones seems to be growing into directing (it’s certainly better than Theatre of Fear, made the previous year) and manages to create a decent sense of atmosphere, while its very familiarity feels almost comforting. It all ends with an entertainingly self-referential coda in which a new tenant (called ‘Andrew Jones’) arrives to stay at the house.